Two men aboard a flight heading from Tokyo, Japan, to Los Angeles, California, got into a wild fistfight on Monday night -- and it was all caught on camera. The shocking cellphone footage was captured by passenger Corey Hour aboard All Nippon Airways (ANA) Flight NH6, moments before the plane left Tokyo's Narita International Airport to begin the 11-hour journey to LAX. 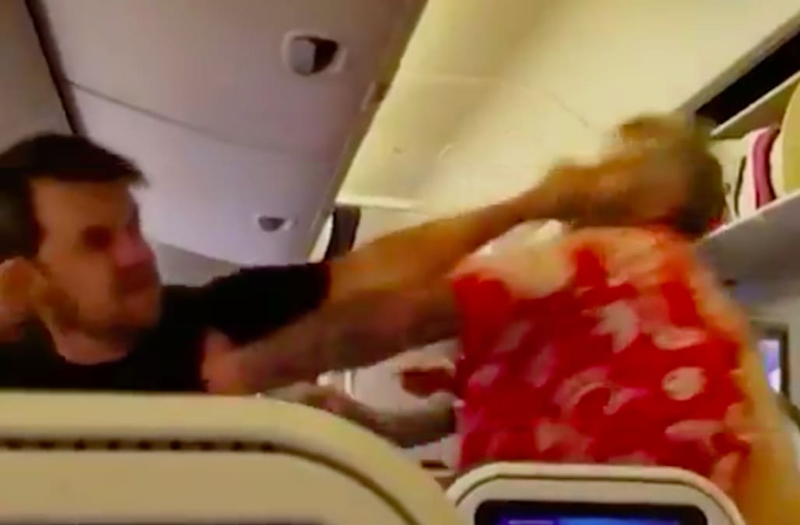 In the video, a man in a black T-shirt and headphones can be seen looming over the row in front of him when suddenly, a passenger in a red Hawaiian shirt springs up from his seat and throws a right hook at him. After the first punch, all bets were off. Hour says he eventually stepped in to bring the violent tussle to an end. The man in the red shirt was escorted off the aircraft by personnel shortly thereafter, according to CNN. As for the reason behind the brawl? Not even Hour knows. "No one provoked him -- he was cool up until a few minutes before he started hitting the guy," Hour told CNN. "He started verbally abusing and intimidating people. Nothing triggered him, it just happened." Although ANA apologized to passengers for the 90-minute flight delay, Hour did his best to make it clear that the airline was not at any sort of fault over the incident. "For the record ANA staff and passengers handled the situation with grace and respect," he wrote. "They did the best they could to diffuse the situation."